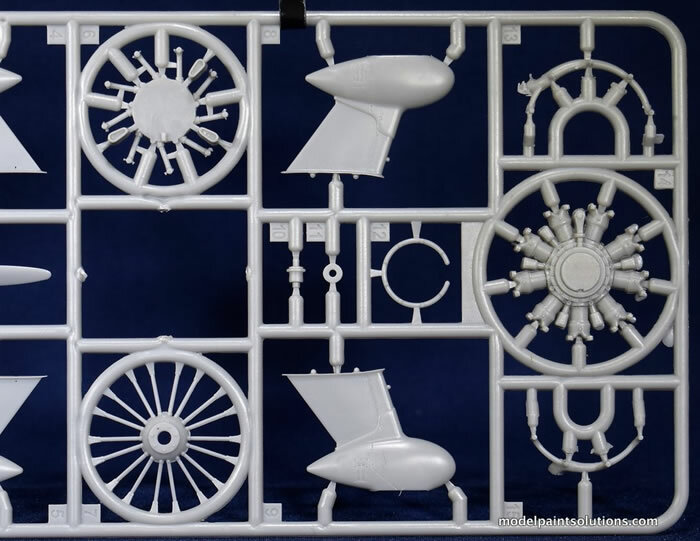 55 parts in grey styrene, 2 clear parts, 19 photo-etch parts, one decal sheet with markings for 2 airframes, and die-cut sheet of masks for the red and white Gee Bee scheme. 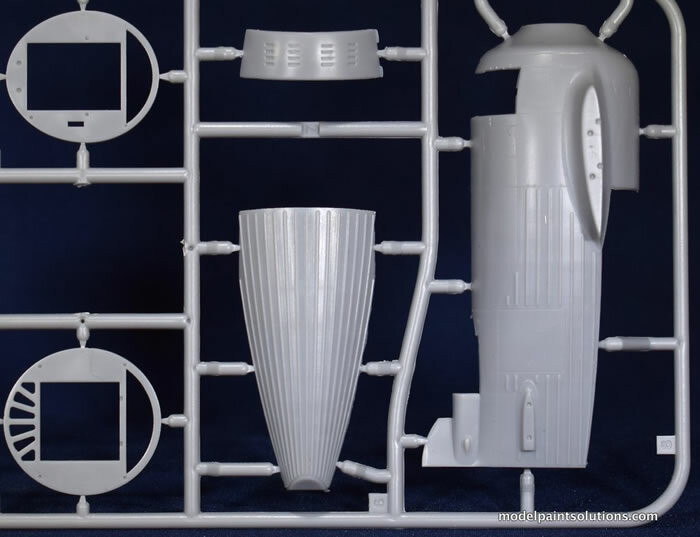 Nicely molded with scale appropriate inscribing and surface details; PE seat harness, flying wires, and braces; Die-cut masks to aid in painting the red/white scalloped scheme. Somewhat of a limited-run kit so a little extra effort will be required. Granville Brothers Aircraft was in operation from 1929 until its bankruptcy in 1934. The firm, located at the Springfield Airport in Springfield, Massachusetts, was composed in part by the Granville Brothers; Zantford, Thomas, Robert, Mark and Edward. They’re best known for the production of the three Gee Bee Super Sportster air racers, the Models Z, R1, and R2, which are synonymous with the golden age of air racing. The 1932 the Granville Brothers began design work on the R-1 and its sister plane, the R-2, which were both successors of the previous year's Thompson Trophy-winning Model Z. Assistant Chief Engineer Howell "Pete" Miller and Zantford "Granny" Granville spent three days of wind tunnel testing at NYU with aeronautical engineering professor Alexander Klemin. Gee Bee aircraft had a very peculiar design based on Granville’s reasoning that a teardrop-shaped fuselage — especially as seen from directly above — would have lower drag than a straight-tapered one. This accounts for the Gee Bee’s fuselage being wider at the wing attachment point[s] than at the engine. Being a purpose-built aircraft, the cockpit was positioned far aft in order to give the racing pilot better vision while making crowded pylon turns. The R-1 won the 1932 Thompson Trophy race, piloted by Jimmy Doolittle. He also set a new world landplane speed record of 476 km/h (296 mph) in the Shell Speed Dash. The distinction of a landplane record was noteworthy because, at that time, specialized speed seaplanes such as the Macchi M.C.72 were faster than landplanes. The Springfield Union of September 6, 1932 quoted Doolittle as saying, "She is the sweetest ship I've ever flown. She is perfect in every respect and the motor is just as good as it was a week ago. It never missed a beat and has lots of stuff in it yet. I think this proves that the Granville brothers up in Springfield build the very best speed ships in America today." The R-1 rapidly earned a reputation as a potentially dangerous machine. The small wings, low polar moment of inertia, and tiny control surfaces made for an aircraft that could rapidly get away from all but the most skilled pilots. This shortcoming was common to most air racers of the day. During the 1933 Bendix Trophy race, racing pilot Russell Boardman was killed, flying Gee Bee Number 11. Similarly, the Gee Bee R-1 stalled and crashed after taking off from a refueling stop in Indianapolis, Indiana. The R-1 was later repaired and modified with a fuselage extension of approximately 18 inches creating the "Long Tail Racer." It was decided not to rebuild the wings, but to use the original wings from the R-2, which had been removed in February 1933 when a new wing with flaps was built and installed. This aircraft crashed in a landing overrun incident soon after it was built, but Roy Minor, the pilot, was not severely injured. After another rebuild, the Long Tail Racer was sold to Cecil Allen. Against the advice of the Granville’s, Allen modified it by installing larger gas tanks aft of its normal center of gravity, which apparently made the aircraft unstable in pitch. Allen took off with a full fuel tank, crashed, and was killed. After this final crash, the aircraft was never rebuilt. Non-flying replicas of the R-1 have been built at the New England Air Museum and the San Diego Air & Space Museum using original plans for the aircraft. Another is displayed at the Lyman and Merrie Wood Museum of Springfield History at the Springfield Museum. A flying replica of the R-2, built by Steve Wolf and Delmar Benjamin, first flew in 1991. Benjamin flew an aerobatic routine in this aircraft at numerous airshows until he retired the aircraft in 2002. This aircraft was sold to Fantasy of Flight in 2004 and is on display at Polk City, Florida. Note that the R-2 originally used a 550 hp Pratt & Whitney R-985 Wasp Junior nine cylinder radial power plant, as the aircraft was designed primarily as a cross-country racer with increased tankage that did not require the larger 800 hp Wasp. In 1933, the R-2 was modified for closed-circuit racing and was fitted with the more powerful engine and cowling of the R-1 version. Other modifications included a larger wing equipped with flaps. I was fortunate to see Delmar Benjamin fly his Gee Bee R2 replica in the mid 1990s and it left a lasting impression. The sight of that surprisingly small barrel-shaped airplane flying knife-edge down the length of the runway was nothing short of unbelievable and only solidified my fascination with aircraft of the Gee Bee lineage. 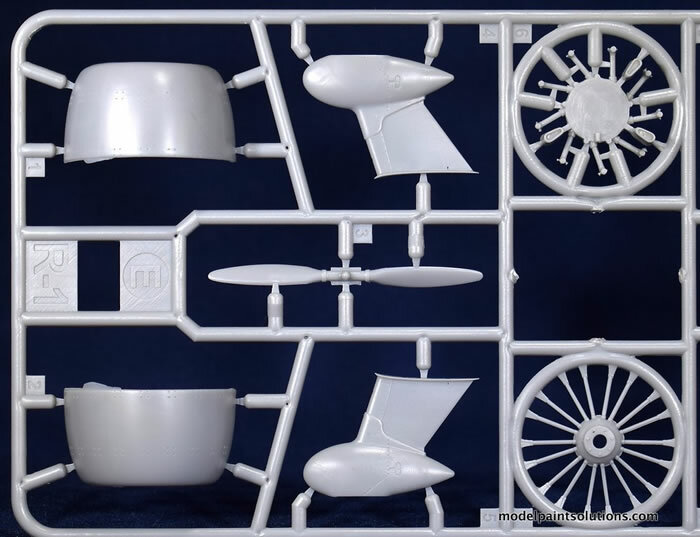 The Granville brothers’ creations have been pretty well served in scale with the Gee Bee R2 in 72nd by Amodel, the old Testors/Hawk and Lindberg Gee Bee’s in 1/48 and the 1/32 offerings by William’s brothers. With a bit of extra work some of these kits build into beautiful models although all show their age. The arrival of a new-tool Gee Bee is welcome indeed. Many thanks to Skyway Models for always stocking new and novel kits that keep eating into my retirement fund. 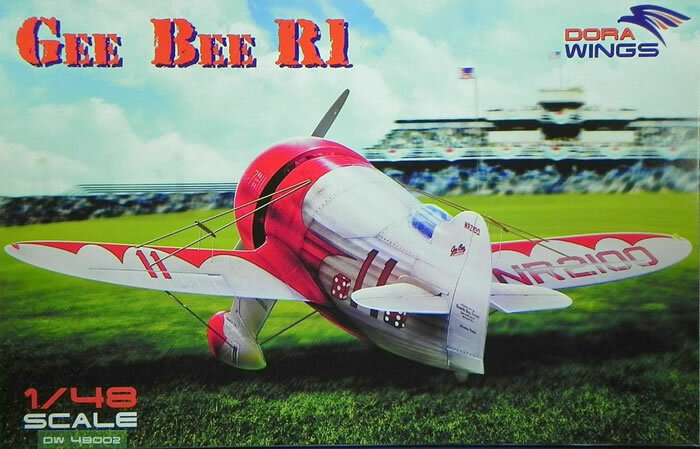 On the somewhat flimsy box top is a slightly cartoon-like depiction of the Gee Bee R1 sitting on the ground. A profile image of the R1 is found on the side. 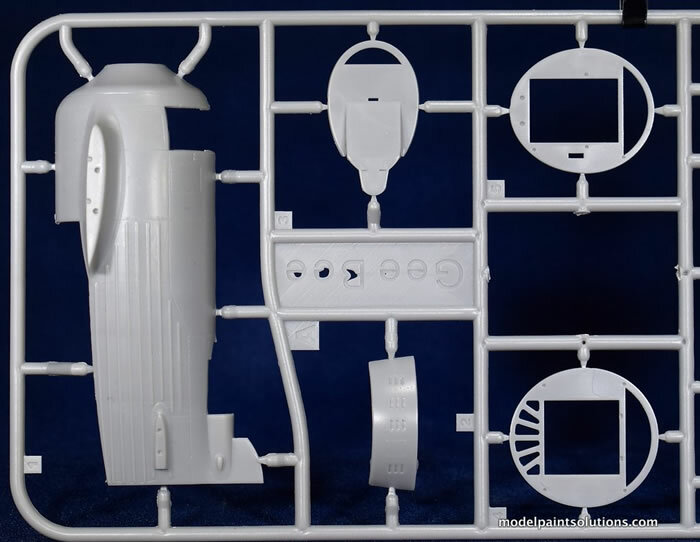 Inside the box are 4 small light grey sprues and the initial impression is one of a well-done limited run kit. This is not a simple model and the detail seems to be abundant and scale appropriate. The inscribed panel lines and surface details are nicely done. 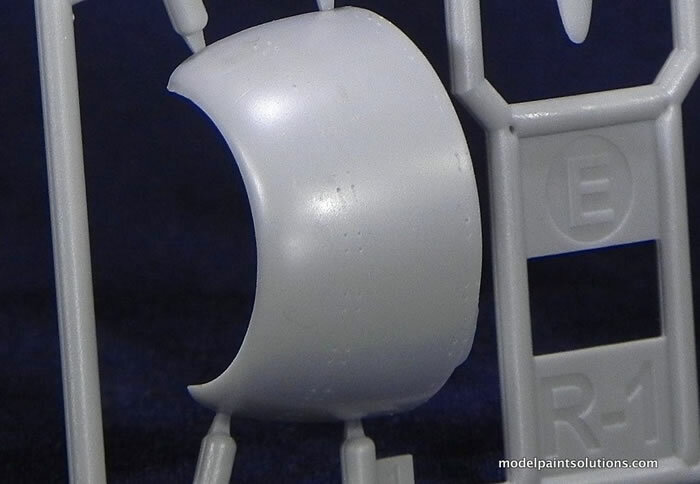 Cowl and panel fasteners are replicated as holes, which are so small they may be lost under primer and paint unless they’re refreshed with a small drill bit. In addition, the ribbing on the sides of the fuselage and belly seems a bit too pronounced but this will be easy to address with a little careful re-working with abrasives. As usual the build starts with the cockpit and here the kit provides nice details straight from the box. The well-molded, multi-part seat, complete with PE belts, is surrounded by a tube frame with a throttle quadrant and PE levers. 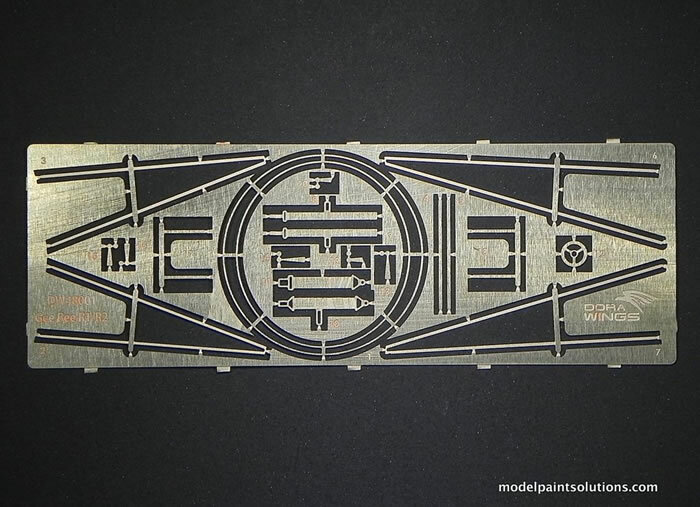 A well-printed instrument panel decal is provided and will be adequate for most. That said the model can be built with the starboard cockpit hatch open and I suspect this will be too much temptation for super-detailers armed with aftermarket instrument faces and PE bezels. This model is just asking for a super detailed open cockpit job. Once assembled the cockpit is captured between the fuselage halves with the belly provided as a separate piece. The single-piece Pratt & Whitney R-1340 Wasp is very nicely molded. The addition of the a separate exhaust collector and push rod assemblies will make for a convincing engine and here again this is an area that would benefit from some additional detailing in the form of ignition wires and assorted engine accessories. 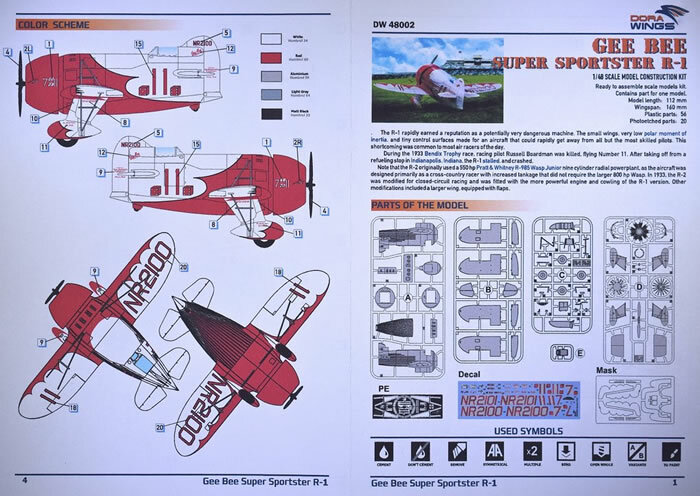 Considering the size and shape of the Gee Bee Cowl, which in the kit is assembled from left and right halves, much of this detail will be clearly visible. 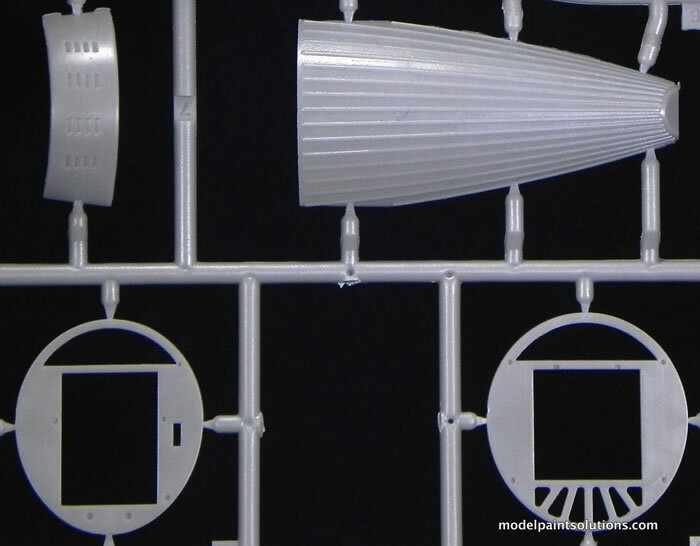 The wings are provided as upper and lower halves with two-piece poseable ailerons. The alignment of the wing to fuselage join is aided by small bumps and recesses on the mating surfaces. The canopy parts are clear but a bit thick. 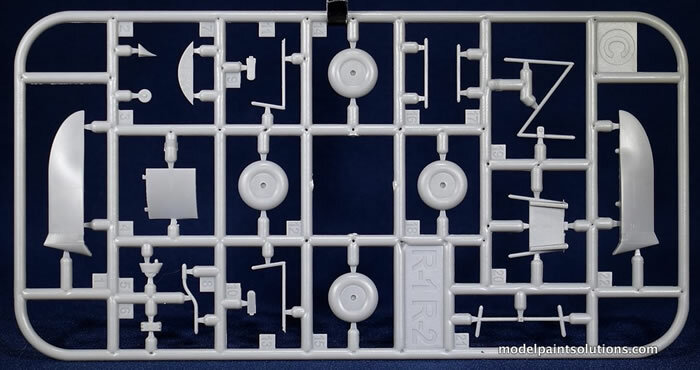 Caution will have to be exercised when removing the parts from the sprue, as the gates are thick. I suggest a razor saw. There is also flash that will have to be carefully removed to allow a good fit of the canopy: nothing beyond someone with a little patience. The spatted main gear is built up from left and right halves, as are the main wheels. The bracing wires between the main gear and the Y-shaped flying wires that project from the dorsal fuselage to mid-wing on each side are provided as nice photo-etch parts. This is a very nice touch and will make the completed model more convincing. The decal sheet printed by Dora Wings has good registration and appropriate color and hue. Markings for both Number 7 (NR2101) and Number 11 (NR2100), the subject of this boxing, are provided. Gee Bee R1, Number 11 wore the well-known distinctive red and white scalloped scheme complete with the large number “11” surrounded by red throwing dice. Die-cut masks are provided to aid in painting the scalloped patterns on the wings and sides of the fuselage. 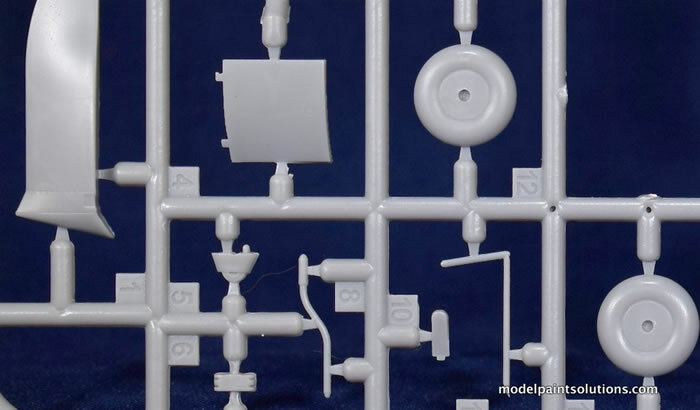 This is a very nice addition to the kit however the material the masks are made from is somewhat rigid and won’t burnish down and seal to the surface of the model easily. 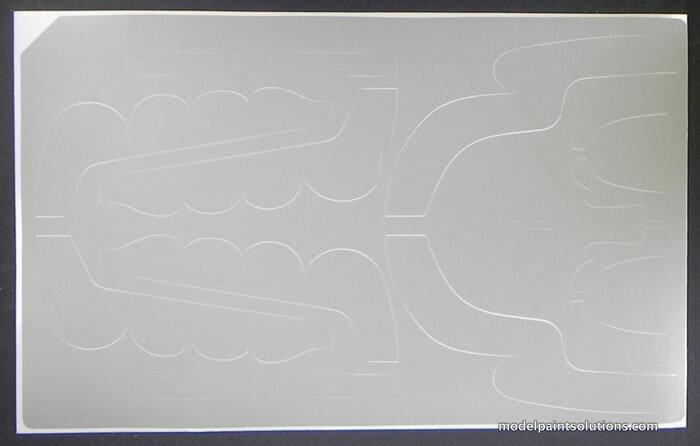 I suspect I’ll use mine as templates to guide in the cutting of masks from sheets of Tamiya tape-like material. What a neat little kit! 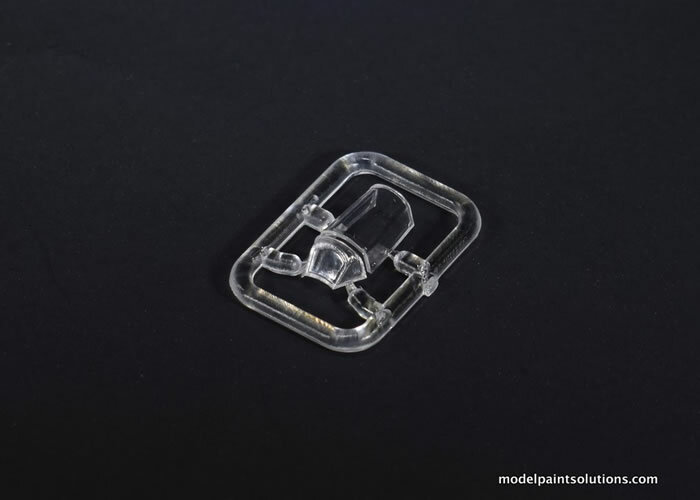 No major issues present themselves however the slightly limited-run nature of the kit suggests you’ll have to expend a little extra time and effort to clean parts and test-fit assemblies. That said this kit should be fun and relatively easy to build. Most importantly, the inclusion of the die-cut masks makes painting the famous Gee Bee scalloped scheme a doable airbrushing project.